As the weather has started to cool down here in Vermont I've started to reach for some of my fall shoes vs. my sandals. Today I wanted to share what I consider my 'must haves' for your fall wardrobe! I've tried to keep all options under $100 because I know how pricey getting a few pairs of shoes can get! I just ordered these the other night & I'm so excited for them to come in. Flats are the most practical shoes for me to wear at work so I love how cute these are while still being comfy. I'm planning on wearing them with a pretty basic outfit like black pants & a simple sweater. I also just ordered these because I was in need of a flat pair of tall boots! These are real leather & under $200, such a great deal & they're the prettiest color! I just purchased a pair similar to these which I featured in my last blog post . They're perfect for transitioning from Summer to Fall as they're not too bulky. I also love the toe shape of these, it's very slimming on the leg! I'm seriously so close to ordering these but I really don't need any more sneakers :( These would be great paired with distressed denim & a tee. 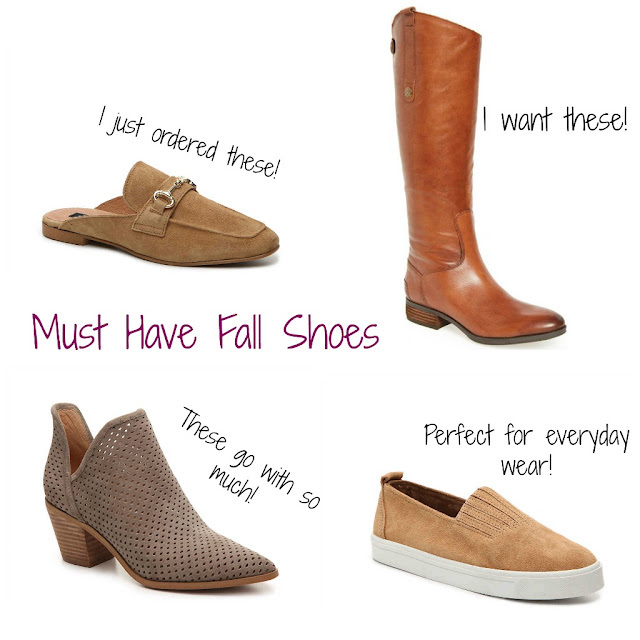 What are your shoe must haves for fall? I love your picks! I'm all about the mules this season, I can't stop buying them! I'm wearing some booties to work this morning!! Crazy it is cold enough for that in August... haha!! Excited to break out my favorite riding boots soon though! So many cute shoes here! I need em all. I haven't tried mules but this pair makes me want to! Love your picks! I actually need to pick up some more tall boots this year! Those tan mules look like they would go with EVERYTHING and I am all about boots/booties in the fall. Boots are my all time favorite type of shoe! I currently need high boots! Also I can never have enough booties! I'm obsessed with mules, so I think I need to make the purchase this fall! I live in little booties in fall time but i am obsessed with mules right now! Love those tall boots — perfect for fall!